CHATBOT… put your hand up if you’ve heard this term lately. While it’s too early yet to FULLY answer that question, we believe Chatbots can be very useful when it comes to modern lead gen — IF used correctly! In simplest terms, it’s a robot that chats! In terms of real estate marketing, a Chatbot is a Live Chat plugin that lives on your website and engages your website visitors with questions and relevant dialogue. The objective of the Chatbot is basically to pre-qualify website visitors & convert them into leads. Then hand them off to you to close them. In a lot of ways, Chatbots are intelligent lead-capture forms… forms that communicate with visitors… COOL! In most cases you can directly step in and take over a chat as it’s happening, or you can wait until the Chatbot has captured a lead’s information and follow up with them sometime shortly afterwards. Most Chatbots claim to be built with Artificial Intelligence (AI) technology, so that they can intelligently and accurately respond to your website visitor’s inquiries. AI technology is in a [somewhat scary] way an evolving and growing organism. A lot of the AI Chatbots I investigated while writing this article were apparently learning from convos, and applying their learning to future chats! NINJA-NOTE: Most Chatbot companies are still using decision-tree logic and not actual artificial intelligence. An example of decision-tree logic is, IF a visitor types “Listings” into the chat, THEN the bot will send a message containing your active listings. Chatbots that posses actual linguistic and language learning capabilities are still scarce. When we use the term AI in this article we are referring to both decision-tree based bots and true linguistic/language learning capable bots. Do I Need or Even Want a Chatbot? Obviously all REALTORS® don’t share the exact same business needs. 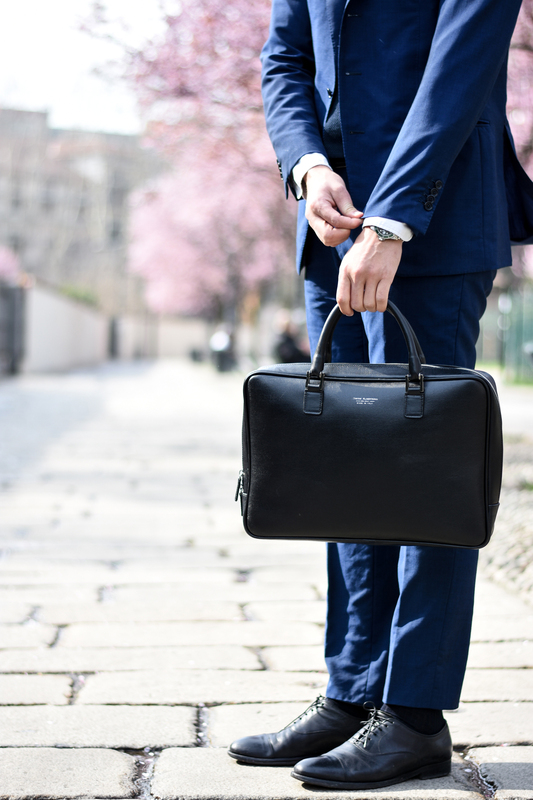 A brand new agent who has ZERO leads and lots of time to drum up business has different marketing priorities than the 30-year veteran agent who gets enough referral business alone to be successful. Luckily, there are so many different types of Live Chat tools and Chatbots, that there is something out there for veteran agents and newbie REALTORS® alike. Identifying the different types of agents. Identifying the different types of Live Chat models. Reviewing 15 different Live Chat apps, and pointing out what agent each chat app is perfect for! New or Idle Agent: Prospects and leads are few to non-existent, they have no hired assistants and have not hired any third party companies to help with marketing… mainly because they’ve made no money yet (and have spent a TON.) These are agents who have more time to promote their business and engage with active visitors of their real estate website <– which might I add should be one of the first marketing expenses new agents incur! Intermediate Agent: Been at it for at least a few years, has consistent prospects and leads generated through various marketing efforts and channels. Often gets referred by other agents and past clients. Will be able to take some of the more VIP live chats from the site, others will get assigned to team or assistant. Veteran Agent: Extremely busy real estate professional, doesn’t have time to chat with website visitors in real time nor does their assistant or team mate. Looking for an awesome real estate website that makes them look great, and also hands them a few new – and qualified – leads every month. Will likely not be able to chat with anybody in real time, nor will assistant. Basic Live Chat: Connecting REALTORS® with visitors on their site in real time, through a chat plugin. AI Chatbot: Visitors speak to a customized robot on your website, and can request to be contacted by the REALTOR®. Hybrid Model: Visitor speaks to a Chatbot, which pre-qualifies them to some degree, then patches the REALTOR® into the conversation. Looking at the 3 different types of chat apps, you can already see how each one might pair up with a specific agent type. For example, a Veteran Agent probably isn’t going to get as much value out of a Basic Live Chat app (no time to take on all the conversations.) Instead, they would be more likely to opt for an AI Chatbot that can do the talking for them, then drop the lead into their CRM for followup at a later date. I’m here to help you find out which one’s perfect for YOU. Which Chatbot or Live Chat Tool Do I Need? For your convenience, I’ve taken the time to review some of the most popular live chat apps in the real estate industry, and in the marketing world in general. For instructions on adding any of these live chat apps to your RealtyNinja website, go here. NOTE: We have not tested each of these products ourselves. We are gathering information from the web and displaying it here for the convenience of our readers. If you have your own experiences with any of these apps, PLEASE let us know so that we can update the review to include your feedback. The Messenger Platform’s customer chat plugin allows you to integrate your Messenger experience directly into your website. This allows your customers to interact with your business anytime with the same personalized, rich-media experience they get in Messenger. Pros: Totally free, already one of the top messenger tools in the world, pretty much everyone uses it and has the app on their smartphone, clean interface, allows for transfer of rich media, stores your chat history in Messenger.com, can chat through Facebook Page or native Messenger app. Cons: Generic, isn’t built for real estate, isn’t created specifically to qualify or capture leads, still in Beta, website integration is a bit more challenging than others. Category: AI Chatbot, advanced lead-gen intelligence that pre-qualifies visitors and sends qualified lead info to you. Marketplace Offer: IMRE is offering a deal to RealtyNinja customers. Claim it Here. Email is clunky and slow, and consumers avoid phone calls when dealing with sales people. 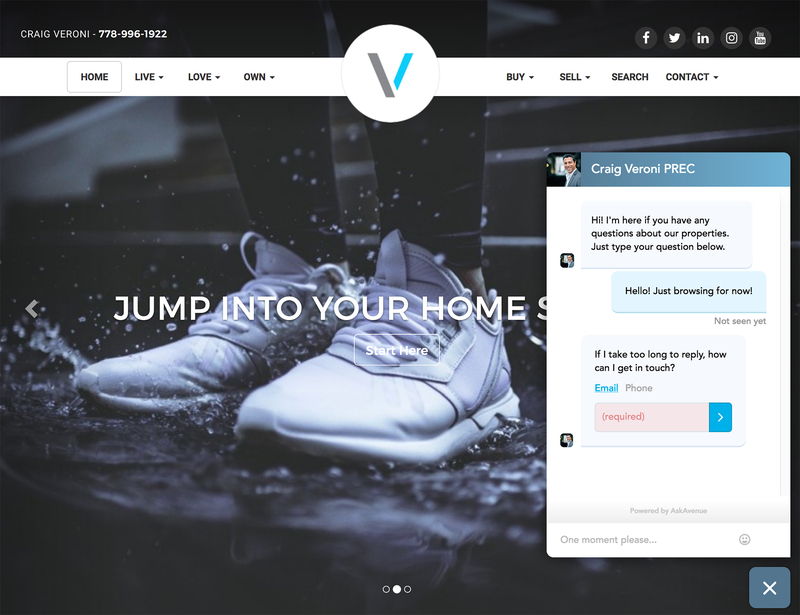 AskAvenue is a mobile chat app for real estate websites that offers a fast and friction-less way to communicate with your online visitors , in real-time. Pros: Made for real estate, official messaging partner of RE/MAX with 20,000 agents using platform, connected to email means AskAvenue will follow up with missed chats via email reply, responsive chat window works well with responsive REALTOR® websites, get notified of real-time chat requests via mobile app. Use the power of smart chat to drive conversions. roof.ai automatically engages with your website visitors and converts them into your best customers 24/7, 365. Cons: Website contains very limited information. HelloAlex helps you go from Awesome Agent to Superhero by helping you eliminate lead guilt and allowing you to finally win the fight of never having enough time. Our Automated Income Assistant helps you create more opportunities to start more conversations, make more connections, and earn more commissions. Category: Hybrid Model, AI Chatbot as well as their own team of assistants who will respond chats on your behalf. Perfect For: New Agents who are trying to drum up new business all the way to Veteran Agents looking for new and intelligent ways to earn and foster leads. Pros: Beyond a basic Chatbot or Live Chat App, acts as a smart personal assistant for REALTORS®, includes email automation, provides drip campaign functionality, ringless voicemail, guaranteed lead followup, has integration with top CRM and website tools, actual humans at HelloAlex will respond on your behalf in certain cases, overall very powerful marketing tool. Hi, I’m Aisa Holmes. I’ll be your personal lead assistant. You interact with me just like you would a real assistant. I’ll respond to your leads within 1-2 minutes and take care of the initial qualifying conversation for you. Category: Hybrid model, where an AI takes the initial qualifying questions and then passes it off to you for followup, or to directly takeover the chat. Perfect For: Intermediate or Veteran REALTORS® who get lots of traffic on their website, and are too busy to follow up with chat requests immediately. Pros: Responds to your leads within a minute, will use emojis and other engagement tactics in conversations, is apparently empathetic to visitor needs, responds to leads from a variety of different platforms (facebook, zillow, website, etc.,) great knowledge-base full of resources. Cons: Quite pricey, with plans ranging from $179 – $499 per month. ReadyChat’s real time chat software and live agents engage website visitors, and turn website traffic into qualified leads by providing exceptional customer service. Learn how ReadyChat can make your website a more engaging lead generation machine. Category: Chat software for your website, monitored by a 3rd party team of real estate savvy live chat agents 24/7. Perfect For: Busy real estate veterans who have no time to qualify leads that they receive through their website. Need someone to pre-qualify the leads and send them a list of people to reach out to. Pros: Very easy to customize to match your branding, no contracts, they claim to convert 80% of chats into leads, don’t have to worry about robots misunderstanding your visitors as it’s powered by humans. With Automabots, you can literally close more deals than humanly possible. Get the most intuitive, advanced real estate chatbots that engage, nurture, and convert buyers and sellers into clients. 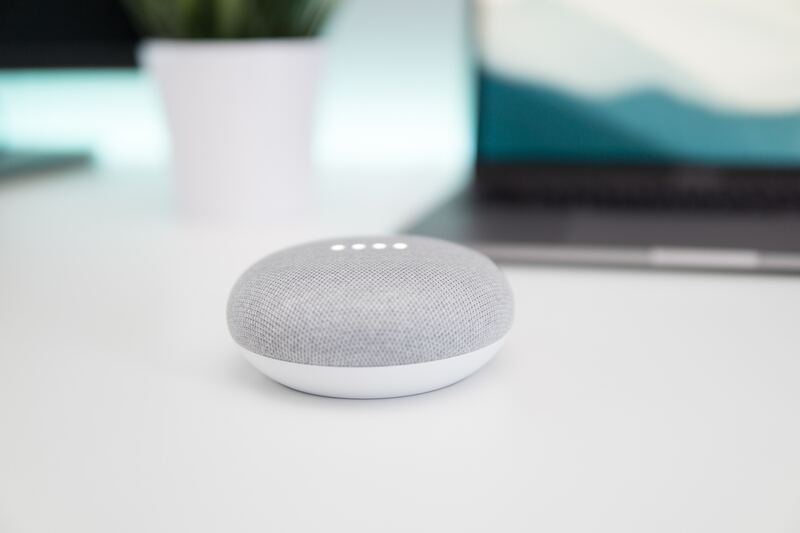 Bots use artificial intelligence to guide buyers through the home search process with conversational language and rich MLS data, and offer advanced valuation tools to provide people the true value of their homes. Category: Hybrid model, an AI chatbot initially speaks to your visitors, with the option of handing the conversation off to you directly or taking a message for you to followup later. Perfect For: Busy intermediate – veteran level REALTORS® who may not have the resources to personally qualify each incoming web lead. Pros: Company produces a variety of tools for REALTORS® (not newcomers to the industry,) claim to increase conversion rates by 300%, you can login to your Automabots dashboard and customize your bot, dashboard includes a mini-CRM which can automatically contact your leads with nurturing followups, every conversation is recorded, AI technology claims to constantly learn from chats. Cons: Nothing obvious! They are USA company (in case you prefer doing business with Canadian companies exclusively) but that’s not really a con. Apartment Ocean develops artificial intelligence based chatbots to help real estate companies to increase customer-generated revenue, reduce customer-related costs and increase user engagement. Once installed, the AI chatbot will be shown as a virtual assistant and it’s ready to go to work. Category: AI Chatbot model, totally automated artificial intelligence chat robot that will send you a transcript of conversations. Perfect For: Intermediate real estate agents who are keeping busy following up with leads, but who have an appetite to automate some of the lead generation process. Pros: Quite affordable, only $49 per month for up to 250 leads – $179 per month for up to 5,000 leads! 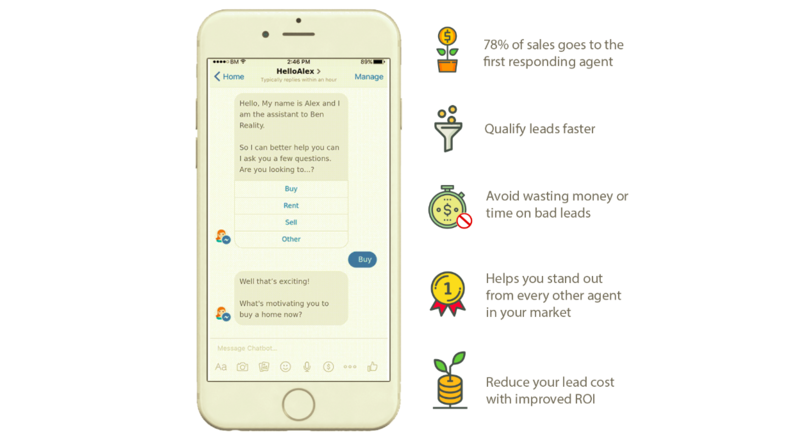 Claims to increase leads for agents by up to 98%, customizable chat window, asks a lot of lead-qualifying questions, leads can be exported to excel and google sheets. Cons: Nothing obvious! Again, they are USA company (in case you prefer doing business with Canadian companies exclusively) but that’s not a con. 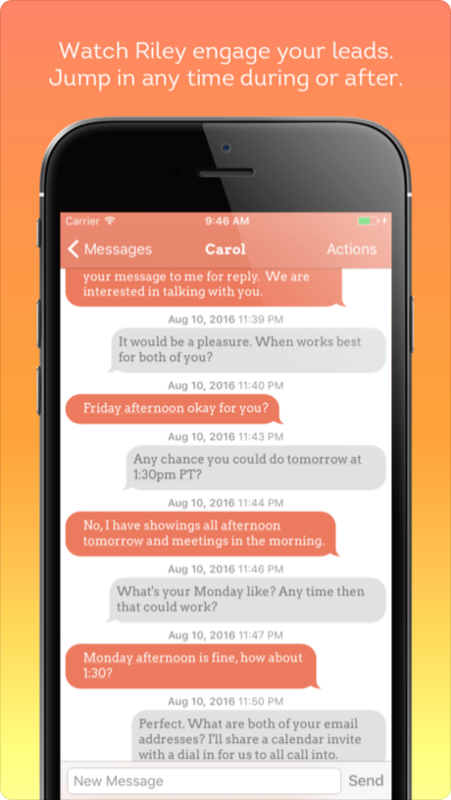 Riley will qualify and schedule appointments with your online leads via text-message within 2 minutes, 24/7. Perfect For: Busy Intermediate or Veteran REALTORS® who are looking to automate their chat process, and follow up with qualified leads afterwards. Cons: The site contains very little information or screenshots about how the tool works, their pricing model is kind of expensive at $199 – $499 per month for 50 – 200 leads per month respectively, this is not proprietary software – it’s built using another live chat provider called Intercom. Streamline your sales & customer support. Systify offers 24/7 live chat support on your website. Our team is always online attending to your online visitors 24/7. 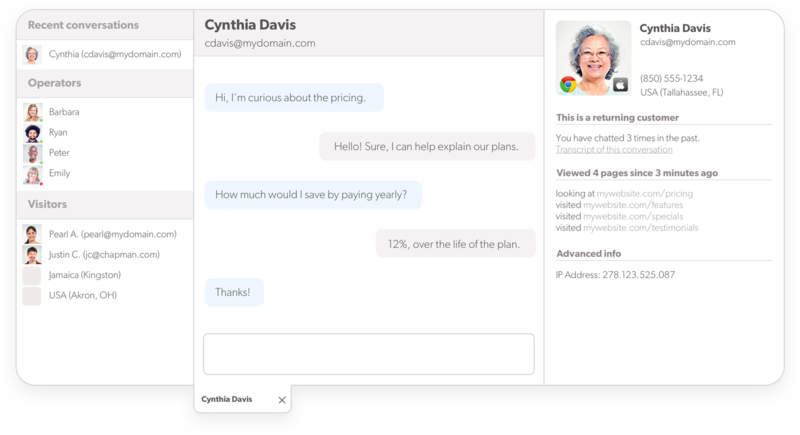 Systify will convert visitors into leads, set up appointments or answer support questions. Category: Live Chat app with a human team behind it to receive your website chats and convert them into leads. Perfect For: Veteran agents who want to stop leaving money on the table! Agents with lots of web leads who have no time to follow up with them. Pros: Actual humans will answer your chats on your behalf, the humans are professional and talented support agents, receive SMS + email notifications, a dedicated account manager will work with you, their internal CRM can automatically connect to all other major CRM services, pay based on a sliding scale (however many chats you have,) 15-day free trial. Marketplace Offer: Systify.co is offering a deal to RealtyNinja customers. Claim it here. 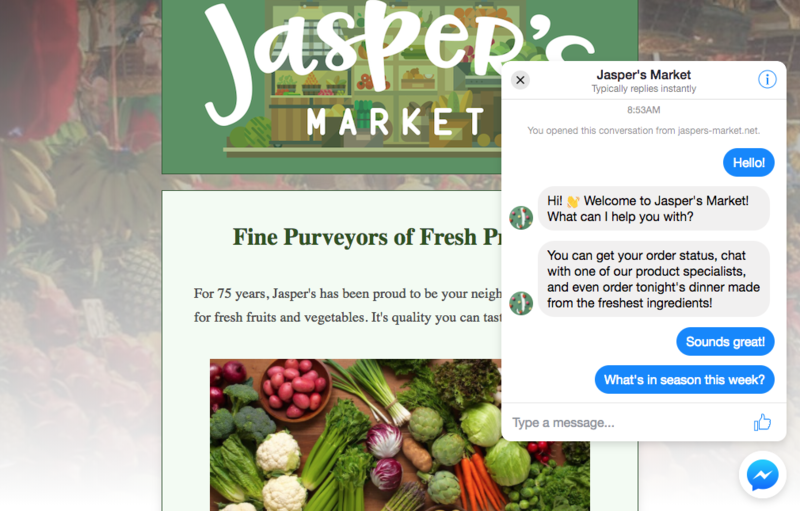 Chat with your website visitors in real time to answer questions and alleviate concerns more easily, building relationships with your visitors and helping them become customers. 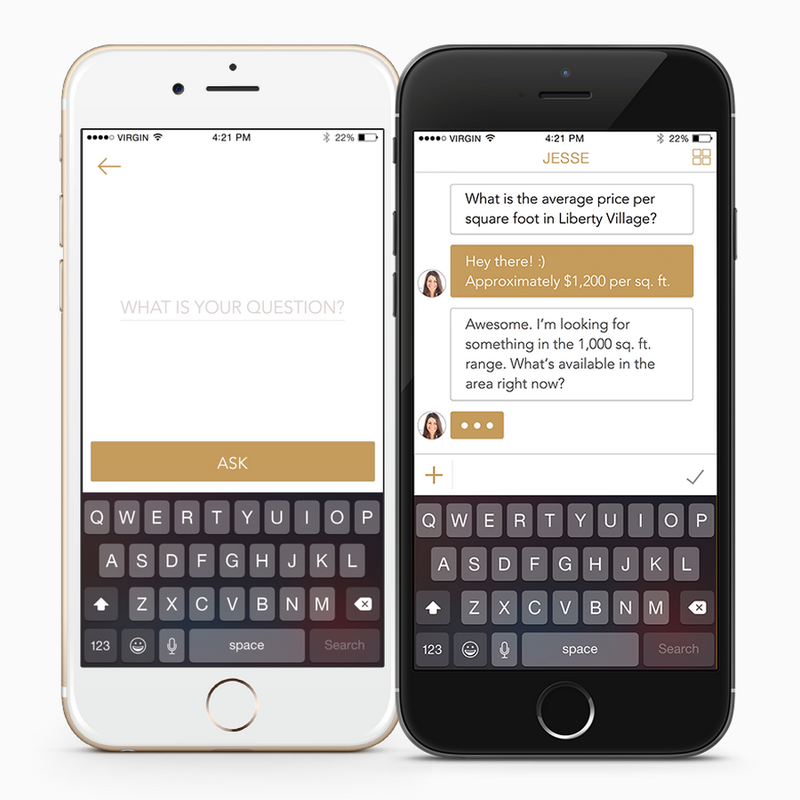 Category: Live Chat App, does not include any AI chatbot, simply a chat widget for your site. Perfect For: New Agents and REALTORS® looking to drum up more business. Agents who have enough time to dedicate to their website visitors in real time. Pros: You can use this tool completely for free for up to 1 user, capture email addresses of visitors who start a chat with you when you’re not there, includes targeted auto-messages for times when you’re offline, includes notifications, read receipts, user avatars and conversation history, speaks 6 languages based on the visitors browser settings, switch between web, desktop or mobile and pickup / takeover chats on any platform. Cons: Not a specific real estate tool, built more with e-commerce in mind than other industries. Make your business human with the world’s simplest live chat software. Real-time reporting. Automated messages. Team management. Olark offers a wide range of customizable features that let you control the chat experience for your visitors and your team. Category: Live chat app that can take messages for you when you’re not available to talk! Perfect For: New REALTORS® and agents who are looking to connect with more of their potential customers, and looking to create more business opportunities. Pros: This is the live chat software we use at RealtyNinja, and we love it! If you’ve ever spoken to us via live chat, you’ve seen Olark in action from the visitor’s side. You can fully customize the look, feel, colours, avatars and more. Provides real-time reporting on chat volume, busiest time of day, visitor ratings on your chats, and lots more. Create automated messages based on visitor behaviour on your website. No limit to number of monthly conversations. Per-agent pricing. Searchable transcripts allow you to find conversations based on keywords. Includes a free plan for 1 agent up to 20 chats per month! Cons: Not a real estate specific app. Category: Chatbot that qualifies visitors of your website for you, then hands them off to you. Perfect For: Busy Intermediate and Veteran agents looking to automate and enhance website engagement and lead qualification. 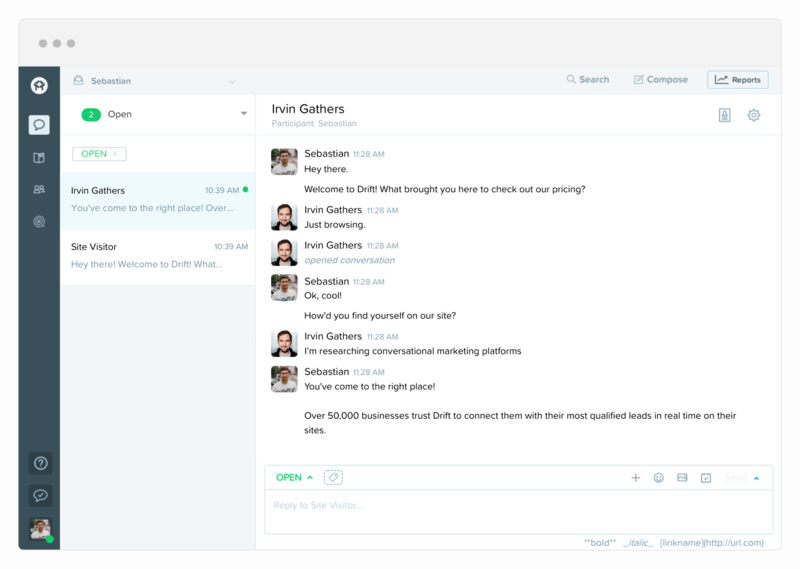 Pros: Drift can book appointments into your calendar for you, ask your website visitors a question to initiate the conversation, provides detailed metrics in a dashboard, pricing starts at $0 for individuals, goes up to $1,200 per month for more advanced Enterprise features. If you have experience using any of these, or other live chat apps or Chatbots, please leave us a comment below or email our team with your feedback. We’d love to include your notes in this ever-growing guide to real estate Chatbots! Still with me? I have a QUESTION for you…. Having read through this entire article, you should have an idea of what Chatbots are and what they can do for different types of REALTORS®. You have also looked over some of the best Chatbots and Live Chat Apps around. What are your thoughts on Chatbots? Please let us know by commenting on this post, or sending a quick email to info [at] realtyninja.com.